Food allergens can be found behind every door and in every bowl of assorted candy at Halloween. For most kids and adults, food allergies are not even a thought, but for some, trick-or-treating can really be a scary experience. However, a new initiative is paving the way for a safer Halloween by increasing awareness of this issue. The number of children with food allergies is on the rise. Approximately six million children (eight percent of all children in the U.S.) suffer from food allergies, according to the American College of Allergy, Asthma & Immunology. Chocolate bars are loaded with dairy, and often nuts or peanut butter. Soy, wheat and eggs are also found in Halloween grab bags, all of which present a potential risk of anaphylaxis to trick-or-treating children, according to the National Institute of Allergy and Infectious Diseases. Navigating the food allergy horrors of Halloween can be tricky, so what can be done? Pumpkin orange may have a new look this Halloween as the Food Allergy Research & Education (FARE) organization relaunches its Teal Pumpkin Project for a second year. Last year, the Teal Pumpkin Project had the support of households in 50 states and 7 countries, according to the FARE project webpage. The project invites households across the globe to paint and place a teal pumpkin on their doorstep if they are offering treats that do not contain allergenic foods. Alternatives to these Halloween treats are small toys, stickers, crayons, and other non-food products. FARE’s website is full of information to help households have a colorful, safe and healthy Halloween. You can even print out one of their Teal Pumpkin Project flyers for your window, letting parents and kids know that your treats are allergy free. The Teal Pumpkin Project was an overnight success last year. Its Facebook post, which launched the initiative in 2014 gained the support of over 2.7 million people in about three days. “We are thrilled to see so many people embracing the Teal Pumpkin Project as a way to ensure kids with food allergies can enjoy a safe, fun Halloween experience just like their friends,” commented Veronica LaFemina, a spokeswoman for Food Allergy Research & Education, in media reports. The Teal Pumpkin Project has also caught the attention of families that are not affected by food allergies. Alternatives to sugary Halloween candy may not be all that bad considering the rise of child obesity and diabetes. The Centers for Disease Control and Prevention (CDC) statistics state that 17 percent of children aged two to 19 are obese. Households with children suffering from diabetes or celiac disease have shown support for the project, according to reports. Halloween is full of surprises. 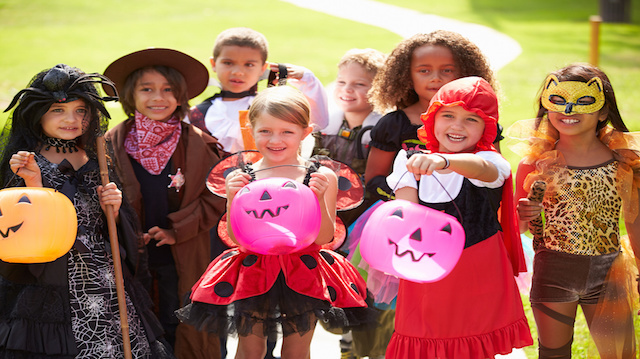 It is crucial to check candy, toys and stickers to make sure they are safe and free of potential chemicals or toxins. Armed with this knowledge, we hope you have a safe and fun Halloween. Will you have a teal pumpkin on your doorstep? Previous articleWant a Healthier Body? Here’s the Veggie You Really Need to Be Eating! Hey Buddy!, I found this information for you: "Teal Pumpkins Make Halloween Safe for Kids with Food Allergies". Here is the website link: https://www.thealternativedaily.com/teal-pumpkins-halloween-safe-for-kids-with-food-allergies/. Thank you.